Konami has just announced 3 compilation titles to celebrate the company’s 50th anniversary. 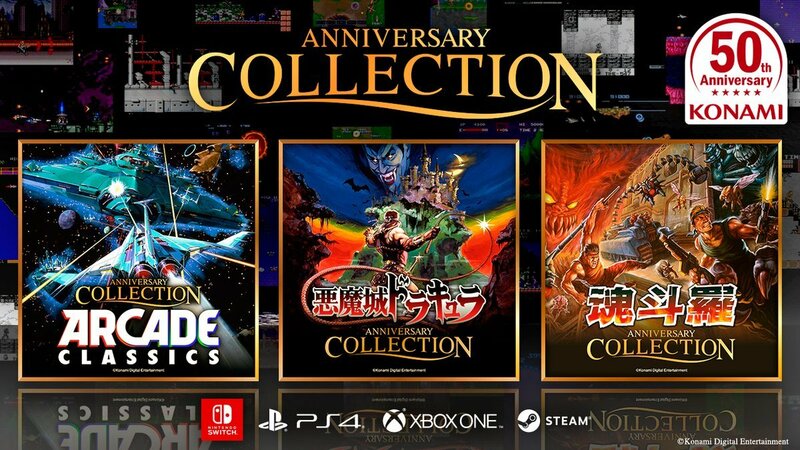 Anniversary Collection Arcade Classics, Castlevania Anniversary Collection and Contra Anniversary Collection have been announced for multiple platforms, including the Nintendo Switch. Anniversary Collection Arcade Classics will be a digital-only title, and it will cost $19.99. It will release on April 18th, 2019. Castlevania Anniversary Collection and Contra Anniversary Collection will release in “Early Summer 2019”. A list of games is down below. Anyone know why the NES version of Contra 1 never gets re-released? Even here, it’s the arcade version. How come other consoles get Ninty exclusives but Ninty fans don’t get other exclusives? Give me Symphony of the Night!!!! Hope the castilvania collection has symphony of the night, 64, and portrait of ruin. I think it is unanimous opinion that the Castlevania Collection won’t be worth it if Symphony of the Night isn’t part of it. Does this mean that the Contra and Castlevania Collections are both physical, since they come with a book? They BETTER BE! I hope we get contra 4. This never came to Europe as far as know. I’ll definitely get the castlevania collection. If symphony of the night is in the Castlevania collection, I’ll certainly get it! For this Collection i Pay no problem 100eur! Hopefully Contra collection will include the Hard Corps games.